The deal turning Team Sky into Team Ineos provides "an impenetrable wall of money" which could turn fans away from the sport, a rival team boss claims. On Tuesday UK chemicals firm Ineos was confirmed as the new sponsor of the team led by Sir Dave Brailsford. Ineos, owned by Britain's richest man Sir Jim Ratcliffe, will potentially increase the team's £35m budget. "You buy certainty," EF Education First Pro Cycling's Jonathan Vaughters said. "You're purchasing the ability to win." BeSpoke podcast: Does Ineos deal change cycling? "You're looking at an almost impenetrable wall of money. You can basically go buy all the best riders. The question for the sport is if they are all on one team, is it fun for spectators to watch? "If you think of it in terms of chess, it's essentially like you're buying more queens. Dave Brailsford has five or six queens on the team. Most teams can only afford one queen. "So if Chris Froome isn't good, Geraint Thomas can win. If Thomas isn't good, Egan Bernal can win. Michal Kwiatkowski, a former world champion, is down the succession and in any other team he would be the diamond of the team. "Even if your strategy is off, or you have bad luck, you're still going to win the race as you've gone over the top financially by such a large margin." Vaughters (left) believes Ratcliffe wants to "buy dominance"
Team Sky's accounts for 2017 showed a budget of £34.5m - the biggest in professional cycling - and Brailsford has been able to guide the team to eight Grand Tour wins during Sky's decade-long sponsorship. Ineos will succeed Sky officially on 1 May but the length of the new deal has not been made public. 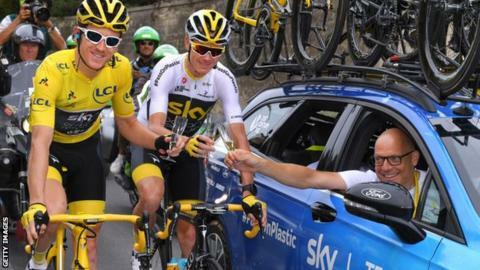 Their sponsorship has already been welcomed by riders Froome and Thomas, who have won five Tours de France between them. Ratcliffe, 66, has already invested £110m in Ben Ainslie's Americas Cup sailing team. Former rider Vaughters, 45, said he was unsurprised by the size of his investment as he feels Ratcliffe - who is worth an estimated £21bn - is not seeking the "straight marketing platform" many sponsors desire. "This seems like a vanity play as in it's something that clearly there's passion and pride behind and someone who wants to buy dominance for personal pride reasons rather than marketing metrics," Vaughters told BBC Radio 5 live's BeSpoke podcast. "The good news is money is coming into cycling. The bad news is unfortunately cycling doesn't have some sort of financial fair play rule system and allows this purchasing of dominance as opposed to having to be creative strategically. I don't think it's great for the long-term health of the sport. "From a rider's perspective, this is all good news. This will bring up the market value of rider contracts. Where it goes a bit sideways is some sponsors will be discouraged and may drop away from the sport as they can't reach the financial level anymore. "Imagine you're a company who wants to put in £20m and you say 'can we win the Tour de France for that?' That's only half of what the current winning team on the Tour is doing. "I think a financial fairness rule would be helpful. In the NFL there are hard caps, so every team operates off the exact same budget. Since that started, the NFL from a fan engagements standpoint has outstripped baseball, NBA, everything else. "A little team can win or a big team can win. That will not happen when you have a sport with no financial control. From a spectator standpoint I think it's kind of fun when the team that no-one expects is able to win." What does the boss of cycling think? Team Sky have won six of the past seven Tour de France races with three different riders in Sir Bradley Wiggins, Froome and Thomas. David Lappartient, president of governing body the International Cycling Union, thinks the arrival of a new sponsor is "healthy" for the sport, although he said a budget cap is "something that can be discussed". "I understand there can be concerns that the team with the biggest budget can have all the best riders and it affects the uncertainty of sport," he said. "The more uncertainty we have in our sport, the better for the interest of cycling. It boosts its attractiveness." Oil and gas company Total has been linked with entering the sport and Patrick Lefevere, the manager of Belgian team Deceuninck-Quick-Step, said: "If it's true that Ineos and Total are making their entry in cycling then this is fantastic news for cycling. "[I] hope that others will follow." Road, track, BMX, mountain and many more - there are so many ways and reasons to start cycling. Got a big cycling race coming up? Make sure you make the most of your warm up with this 20-minute guide.